Slow Food: Where to Find the Best Snail Dishes in L.A.
Snails, the slow-moving garden dwellers that view simple table salt as Kryptonite, now play an increasingly prominentrole on dinner tables, and not just at French restaurants. Snails are frequently imported from Burgundy, though they’ll occasionally have different terroir or hail from the sea. Chefs love to lavish their tender meat with herbed butter, pair them with meat or serve them in rich sauces. Either way, now you know where to snag eight of L.A.’s best snail dishes. Thomas Keller’s French proclivities are well known. 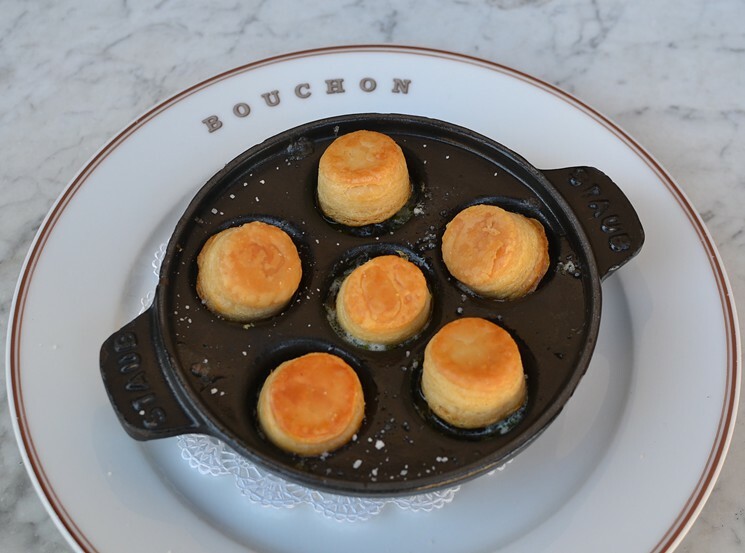 At the sprawling Beverly Hills branch of Keller’s Bouchon Bistro, chef de cuisine David Hands expertly prepares escargots à la Bourguignonne ($16.50). Plump Burgundy snails are submerged in parsley garlic butter in a perilously hot, sixcompartment Staub cast-iron vessel. Each snail hosts a top hat in the form of a Bouchon Bakery puff pastry cork. Puncture with a tiny fork, plunge down into the garlic butter, spear each snail, and eat the whole thing in a single bite. Cassia, the Southeast Asian brasserie in Santa Monica from chef Bryant Ng, wife Kim Luu-Ng, and business partners Josh Loeb and Zoe Nathan, might not be a restaurant where you’d expect to find naan (or snails). However, Ng has crafted a stupendous combo by serving crusty, herb-graced naan bread with chopped escargot ($18) under a menu section titled “Clay Oven Breads & Spreads.” Chef Ng sources wild Burgundy snails from a purveyor named Douglas Dussault, aka “Snail Man.” At Cassia, “colossal-sized” snails come precooked in court bouillon, then are chopped and prepared with lemongrass butter and herbs. Spoon savory snails onto crusty flatbread and you’re golden. Redbird is the seasonal-California restaurant that chef Neal Fraser runs with front-of-house/life partner Amy Knoll Fraser in the former St. Vibiana Cathedral rectory. Even though the airy dining room was once a holy place, Redbird has been known to serve some truly diabolical dishes. Veal Fraser ($96) is a monster, multiperson plate featuring a 24-ounce Strauss Farms veal chop from Wisconsin, lavished with diced, 24-hour braised veal cheeks and wild Burgundy snails from snail man Douglas Dussault. Chef Fraser sautés his snails with garlic and shallots before deglazing with white wine. Veal stock, red wine demi-glace, butter and chopped parsley further enrich this devastating dish. Chef Walter Manzke may be from San Diego, but he’s taken to French cuisine like a native Parisian. The former Church & State chef got that Arts District bistro into high gear with dishes such as escargots en croute, which is now available at République, the multifaceted Mid-City restaurant and bakery he runs with pastry chef/wife Margarita. To create the dish ($17), he cooks Burgundy snails in ceramic ramekins under flaky puff pastry crusts. Each snail luxuriates in a butter seasoned with shallots, garlic, Pernod, parsley and a touch of beef jus. Pry the puff pastry from the ramekin and run it through the rich butter, making sure to grab each snail en route. Spring, a Church & State spinoff in downtown’s Douglas Building from Yassmin Sarmadi and chef Tony Esnault, is certainly picturesque. The duo’s airy atrium dining room features an open kitchen, wood tables, olive green chairs and stools, marble bars and counters, and centrally located trees. As part of the Hors d’oeuvres á parteger menu section, you’ll find starters such as escargot Provençal ($15). Wild Burgundy snails are plated as if they’re still in a garden, surrounded by ingredients like tomato, fennel, garlic and persillade, a bright, herbaceous parsley sauce.